Part chicken pot pie, part chicken and biscuits equals one delicious recipe! 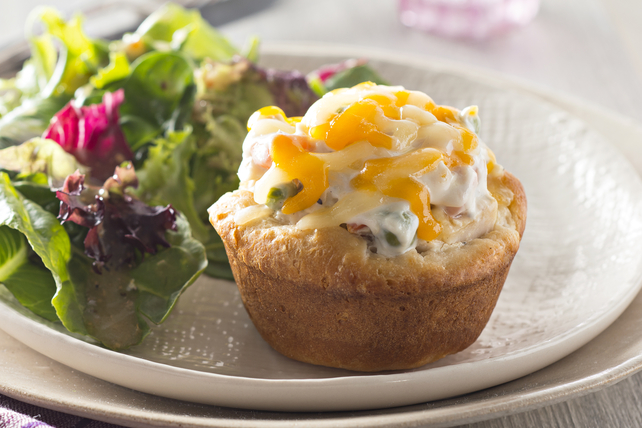 Biscuits get topped with creamy chicken and vegetables and cheddar cheese, and bake away in muffin cups until golden. Mix cream cheese product and milk until blended. Combine chicken and vegetables in medium bowl. Add cream cheese mixture; mix well. Separate biscuits. Press 1 biscuit onto bottom and up side of each of 10 muffin pan cups sprayed with cooking spray. Fill with chicken mixture; top with shredded cheese. Bake 20 to 22 min. or until biscuits are golden brown. Cool in pan 5 min. before serving. Depending on the colour of your muffin tins, the baking time may vary. Generally the darker the pan, the shorter the bake time. Serve with steamed broccoli or a mixed green salad tossed with your favourite Kraft Dressing.